Poppy flower embroidered bespoke cotton shopping bag that can be personalised with a name or initials too! Poppy flower embroidered bespoke cotton shopping bag that can be personalised with a name or initials too! 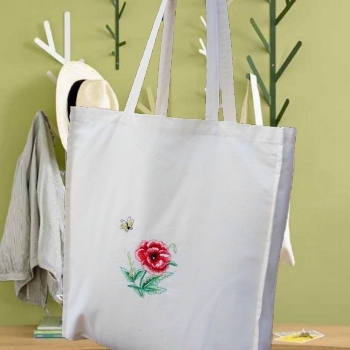 Beat the carrier bag charge with style with this sturdy cotton tote bag embroidered with a bespoke red poppy design. Exclusive to Amys Gifts, not available on the High Street. This all cotton tote bag is 38x43cm with a 10cm gusset so it holds plenty of goodies. Features long handles so it can be fashionably hung over the shoulder. Perfect for the beach, weekends away, hobbies, books or shopping.